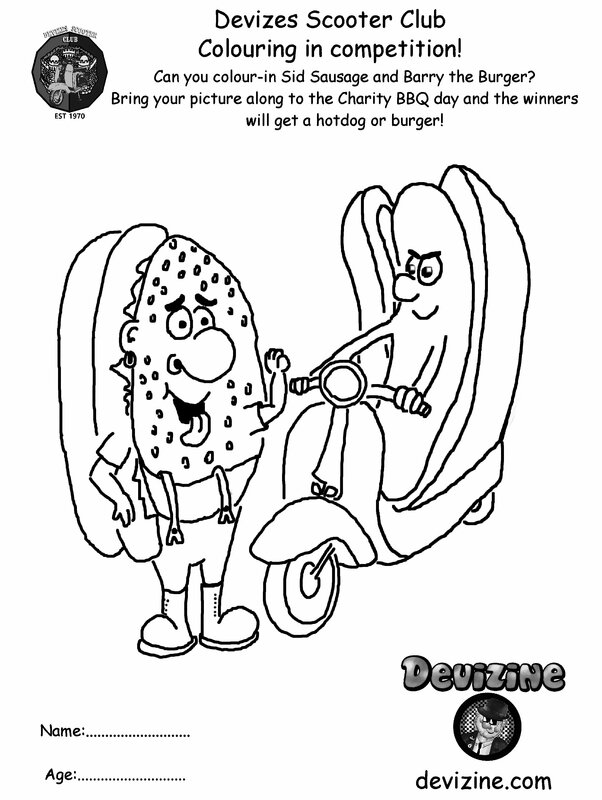 Colour in Billy the Burger and Sid Sausage and WIN a Burger or Hotdog! Billy the Burger and Sid Sausage are raring to get to the Devizes Scooter Club’s Charity BBQ Day at the Conservative Club on July 21st, but they’re looking paler then Scooter Club’s organiser Adam Ford after a few blackcurrant Fruit Shoots. 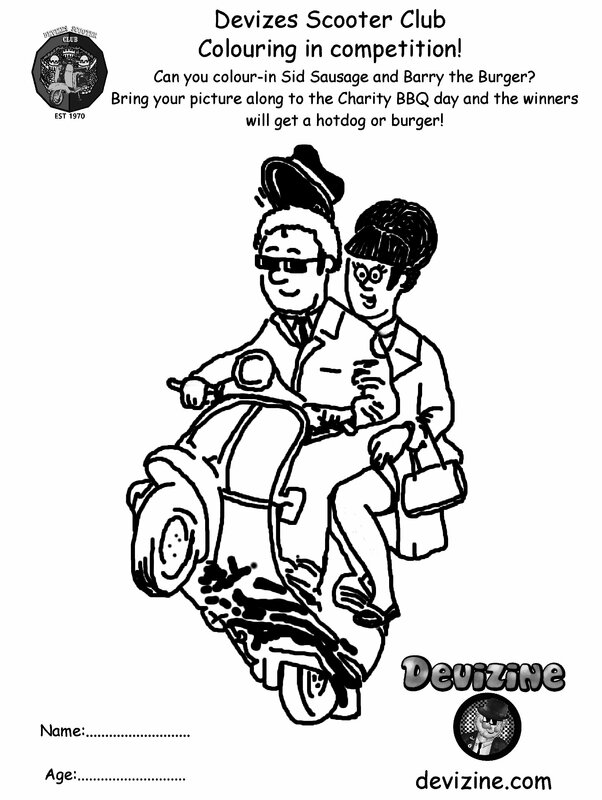 Can you help by colouring them in? Ask Mum or Dad to stop watching the football for just a few minutes and print out either picture, or both, below. Give it your best colouring-in job, bring it along with you to the family fun day and hand it to the DJ, who I think will be me. I’m a very tough judge, so make sure it is your best work! The winners of each age group will get a free snack of their choice, be it a hotdog or a burger. Age groups will be 2-5, 6-10, 10-100; See you there! If you can’t print this out, don’t worry; I will try to get the Club to photocopy some too, and we’ll bring them and some colouring pencils with us; give your Dad something to do won’t it?! Meanwhile grownups will be treated to the excellent DayBreakers, who I’m delighted to announce will be playing live. Everyone is welcome to enjoy the day; let’s raise some funds for the Devizes & District Opportunity Centre, a preschool for children with disabilities and learning difficulties. The Day has FREE entry from midday, with music, fun & games , soft play and bouncy castle, a BBQ and other food and drink including cakes, teas and coffees, a Mega-Raffle plus side stalls, lots of scooters naturally, and trophies for the best scooters.